Equipment held together with nothing but elastic bands and optimism, programmes that no-one watched and an incredible experience that shaped the lives of so many students during – and far beyond – university. That’s YSTV. England’s longest running student television station turned 50 last year – which means it has outlived the once mighty Yorkshire TV. But the digital age has swept aside decades of television tradition and anyone can film and edit what’s now known as ‘content’ on their mobile phones. So what’s the YSTV legacy? And what does the future hold for one of the University’s most enduring societies? We asked former YSTV station directors Jenny Hackett (Jenny Gordon during her time at York) and Chris Ward to tell us how their student telly experience has influenced their lives and careers. “I got involved in all sorts of behind-the-scenes stuff while I was at YSTV. It’s one of those places you get stuck into everything, which is why it’s such a great thing for people to do. “I never wanted to be a cameraman or a vision mixer particularly but because I had a go at doing all those things, I understood what’s involved and how things fit together, which was really useful. “There wasn’t a media course there in my time. I was doing music, which was brilliant and I loved my music degree. “I’d done a little work experience at TV companies before I started at York but not really decided that that was what I wanted to do. Getting to know successful alumni through YSTV gives you the confidence that you can do this. You just have to stick at it. I definitely got the TV bug from YSTV. “I’d been struggling to find TV jobs up in Manchester, which is my home town – although I think that would be different now, because there’s a lot more in Manchester. So I crossed my fingers and moved to London. And I was lucky enough to get work experience at independent production companies almost straight away. And then in April 2004 I got a job at the BBC. “The combination of having done YSTV and a music degree really helped me get my first BBC job, which was on The Proms. “After that, I spent a good few years moving around departments, just working wherever they needed a production co-ordinator or a gallery PA. That gave me really good, rounded experience. “And then I joined Sport in 2008. As soon as the move to Manchester was announced, it just worked for me to stay with Sport. I was very lucky. “Live television was always the thing that I enjoyed working on most. Children’s TV has quite a bit of live programming. But in sport you get these live events every weekend. And that’s what I love doing, being on site and dealing with problems. “York has a great track record of people going into the media and I think that’s because of YSTV and the other media societies. Even before it had media courses, it was producing great people, just because everyone gets stuck in and has a go. “It’s about that extra level of hands-on experience, being able to say, ‘We’ve made a programme with a tape machine that we held together with elastic bands’. “If you’re working in a professional company, you’re not going to have the same experiences. But because you’ve been through that, you get quite good at problem solving or figuring out new ways of making things happen. “Now I’m on the other side and I interview and recruit people. Whatever degree you’ve got, it’s very good that you’ve got that on paper but actually I’m much more interested in whether you’ve done any work experience? Do you really know what this job entails? “I don’t want someone coming in who thinks it’s going to be a glamorous exciting job. Because a proportion of it is sitting at a desk hammering out emails, dealing with problems! So I think people who have done student TV probably have a bit more of an idea about that when they come in. “YSTV had another massive impact on my life – I met my future husband Tim through it! We weren’t even at uni at the same time. It was just through the rich group of alumni that YSTV has. He graduated in ’99 and I started in September ’99. “Like a lot of people, I joined up to YSTV at Freshers Fair and I just loved it. “We learned how live telly works and that was great fun. The equipment was old and rickety and we had these black and white monitors that I think had been donated by Yorkshire TV in the 80s. “It was cobbled together with cables and gaffer tape and god knows what. 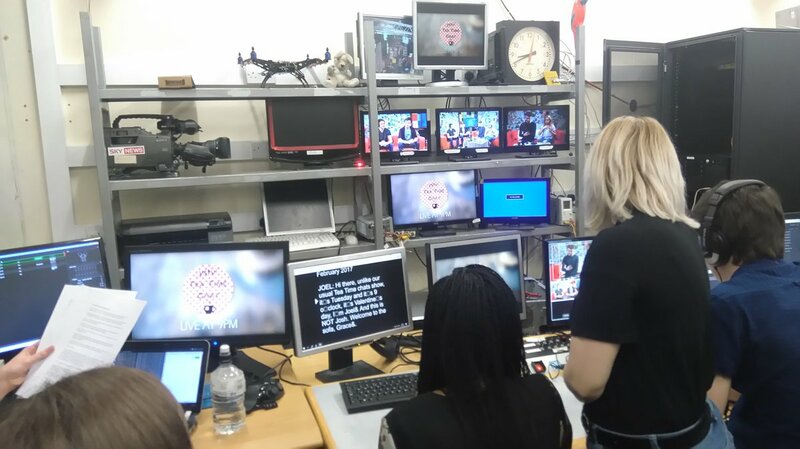 I was never a technical person but electronics students and people like that kept it all running – and now some of them do really, really senior engineering jobs in television. “But the beauty of it was the live TV programmes were put together in exactly the same way as real live telly is put together, albeit there’s much more fancy equipment and professional cameras and studios. “I hadn’t known what I wanted to do. I ended up doing maths because you’ve got to pick a subject! It would have been a million miles away, the thought that I could actually go and work in TV. “But you join up, you walk in and you see cameras and a little studio. You think, wow, this is amazing. And then former students came back and I met people who were working in TV and it became, ‘Oh, I could do this. This could be actually a career’. “It was pure chance that I went to York and found a student TV station. I didn’t even know there was one there. If I hadn’t, I’d be probably an accountant by now! “When I left York and then went to work in ‘proper’ telly, the first day I walked into a real gallery, I knew how it worked. It may be a million times fancier than YSTV but you know essentially what everybody’s doing and how it all fits together, based on this rickety little set-up that YSTV had back in the day. “I’d done work experience in my university holidays and then at various TV stations but essentially my first job after leaving was for a company called Princess Productions. “It was at the very beginning of the reality show boom. I did a show called Jail Break on Channel 5 that nobody watched and then from that I got on to the GMTV trainee scheme and basically that’s how I ended up at ITV. “In those days, GMTV was a separate company. I was a runner and then a trainee researcher and then a researcher – you have a flavour of all the different bits of GMTV. I ended up working on Lorraine Kelly’s bit of GMTV and when ITV took over, I stayed with Lorraine when she got her own show. “And I’ve been here forever since, really, with a few relaunches along the way. I’ve moved through assistant producer, producer and I’m currently the deputy editor of the programme. I can trace it all back to YSTV. “Some things have changed a lot. Obviously, technology has become very accessible, so if you’re interested in TV, take time to learn how to do that, because that wasn’t something we were able to do. “But essentially, it’s not changed in that you’ve just got to get your foot in the door. You’ve got to get as much work experience as you can and make yourself noticed when you’re doing it and make people remember you and become invaluable! Sadly, it’s still about working for free for a little bit and putting yourself out there, essentially. “And tragically, there’s still an element of who you know. But that’s about meeting people and you can engineer that yourself. “There’s a million people who want to work in TV. But the good ones will always shine through. It’s very tough and it’s very competitive and I interview researchers now who blow me away and I think, ‘I would never have got a job if I was up against this back then!’. “The competition is fierce but if you’re good, you’ll do it. I firmly believe that.